Discussion in 'Off Topic' started by Zerosh, Sep 12, 2014. Jimbo9, R4Ki, cronkllr and 3 others like this. What do you mean "life is boring"? Are we living on the same planet? R4Ki, Steve Harvey and (deleted member) like this. Interesting and fairly accurate results. Individual traits: Extraverted – 67%, Intuitive – 91%, Feeling – 64%, Prospecting – 82%, Turbulent – 68%. Strength of individual traits: Introverted: 51%, Intuitive: 73%, Thinking: 88%, Prospecting: 93%, Assertive: 57%. ESTP apparently. But these tests always frustrate me with how simple they are there are way more facets to a person than this! INFP - Surprising to no one who knows me. Though, I've taken many of these over the years, sometimes I'm more Thinking than Feeling, and sometimes more Judging than Perceiving. 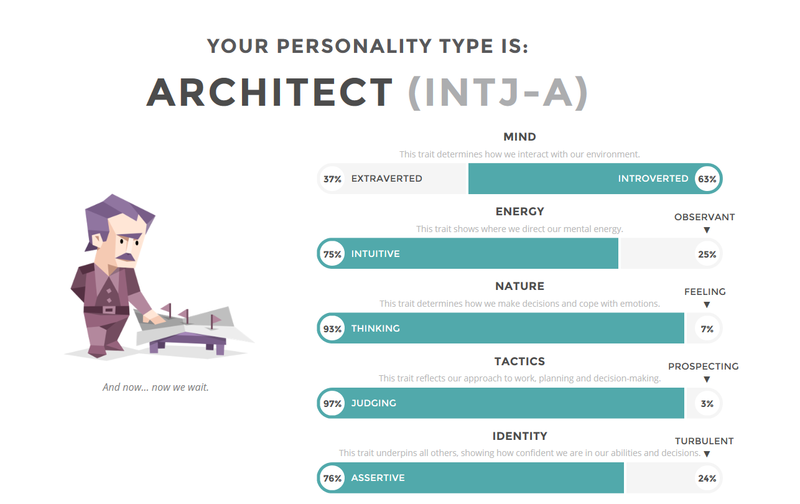 I think I always fall into INFP, INTJ, or INTP. I took this months ago. I am redoing one again now to verify. Looks like I haven't changed much. I got: ENTJ "The Commander". Ok, I spent some time compiling the data on the thread. So far, 43 agents participated in the test. Hadn't done one of these in ages, got a radically different result than five-ish years ago. If I'm a protagonist, how does my story end? Feelin' real Aladeen about this. This got surprisingly accurate results for me. Not just ENTP, but ENTP-T Debater. I'm tempted to actually get the paid profile. My result is INFJ-T "The Advocate"